← Cell Phones and Driving: Do You Value Your Life? Have you seen the movie, How Do You Know? It’s a 2010 romantic comedy starring Paul Rudd and Reese Witherspoon. It also has Owen Wilson and Jack Nicholson in it. If you like romantic comedies, there’s a good chance you’ll enjoy the movie. It’s a movie written and directed by James L. Brooks who also directed As Good As It Gets. Anyhow, there’s a quote (from Paul Rudd’s character) that I wanted to share with you. I think you might find it… enlightening. To put it in context: Paul Rudd’s character (George) is trying to decide whether he wants to go to prison for his dad (Jack Nicholson). To make this decision, he needs to find out whether the girl he loves Lisa (Reese Witherspoon) would rather be with Matty (Owen Wilson), who she’s currently with, or him. I found a version of this clip on YouTube, so I’ve also included it below the dialogue I transcribed from watching the clip. George: This is only half the gift. It doesn’t work without the story. This stuff was invented by this man in Central Ohio as white goo and he used it to remove soot off of wall paper from old-fashioned heating. So, when gas and electric heating came, there was no longer a need for the cleaning goo. So, the guy was going under. But, his sister-in-law, was a nursery school teacher. Lisa: Now, is this a true story? George: The man’s name was Joe McVicker. His sister-in-law was Kay Zufall. Lisa: OK, I believe you. George: So, Kay Zufall, discovered that her little kids liked squeezing the goo a lot more than hard modeling clay. 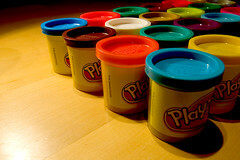 So, she suggested to her brother-in-law, Joe, they color the stuff and call it play-doh. George: So, I have kept this for a long time as proof that we are just one small adjustment away from making our lives work. This entry was posted in Entertainment, Wisdom and tagged As Good As It Gets, Fresh Perspective, How Do You Know, Jack Nicholson, James L. Brooks, Joe McVicker, Kay Zufall, Modelling clay, Movie Quotes, Movies, Ohio, Owen Wilson, Paul Rudd, Plasticine, Play-Doh, Quotes, Reese Witherspoon, RomCom. Bookmark the permalink.